Professor Barbenfouillis proposes the building of a rocket to the Moon before a group of fellow astronomers. The rocket is launched from a giant cannon and impacts into the Man in the Moon’s eye. Its crew explore the lunar surface and encounter the native Selenites. After escapades among the Selenites, the group are captured and taken prisoner before the lunar leader but make an escape and return to Earth. Georges Melies (1861-1938) was one of the foremost early silent filmmakers and is often referred to as the father of special effects and (incorrectly) as the maker of the first science-fiction film. Melies was born in Paris to a father who was a maker of quality shoes. In his teens, Melies became fascinated with stage magic. After his father retired, the twenty-seven year-old Melies sank his share of the family business into buying the Theatre Robert-Houdin, which had been established by the celebrated magician Jean Robert-Houdin (who later lent his surname to an even more famous magician Harry Houdini). The watershed event in Melies’s life was his attending a screening of the very first film, the Lumiere Brothers’ The Arrival of a Train at La Ciotat (1895). Melies immediately became captivated with the possibilities. He tried to buy a camera from the Lumieres who refused him but obtained one from England and within a matter of months was screening his own films at the Theatre Robert-Houdin. The earliest of Melies’s films were documentary shorts that simply filmed real life in the Lumiere Brothers style – even works that were blatantly copying the Lumieres such as The Arrival of a Train at Vincennes (1896). Soon after this, Melies discovered fantasy cinema and trick effects – his creation of special effects came about by accident when his camera jammed while filming a procession and a carriage appeared to turn into a hearse. He then began to experiment with simple stop-camera substitution effects – not unlike the way a conjuror produced tricks on a stage. The first of these was The Lady Vanishes (1896) wherein Melies went with the old magician’s trick of making a lady vanish. Around the same time, he also made The Devil’s Manor (1896) (which is often attributed as being the first horror film) and went onto a great many others. Melies built the world’s first studio in his garden in Montreuil, although electricity was so new at that point that there was no such thing as lighting so the studio was built as a glasshouse that was lit by natural sunlight, meaning that Melies could only shoot when it was a sunny day. Employing increasingly more elaborate props and sets, Melies began to produce films of considerable sophistication. He would go onto make over 500 films in a seventeen-year career between 1896 and 1913. However, he was forced into bankruptcy in 1913 after a distribution deal with Pathé that went sour, forcing him to sell his studio, a bitter experience in which he destroyed all the prints of his films (some 300 of these are lost today). Subsequent to that, Melies eked out an impoverished career as a toy salesman from a booth in the Monpratnasse train station. He was rediscovered and a celebration of his life’s work screened in 1929, before he was awarded the Legion d’Honneur in 1931. Melies had ventured into a similar territory before with The Astronomer’s Dream (1898) in which an astronomer is taunted by the face of the moon that appears in his observatory and discharges dwarfs and dancing nymphs from its mouth. However, A Trip to the Moon was Melies’s most ambitious work up to that point – and is invariably the one film that he is remembered for today. The rocketship impacting into the Moon’s eye has become an iconic cinematic image. Melies raided ideas from his countryman Jules Verne’s novel From the Earth to the Moon (1865) from which is taken the image of the Moon launch being conducted by a projectile being loaded into a cannon. Verne never had his explorers actually land on the Moon and for this Melies borrows from H.G. Wells’ just published The First Men in the Moon (1901) where Wells had an expedition to the Moon and explorers encountering a society of Selenites. The difference is that Melies puts everything to comedic effect, whereas both Verne and Wells played their stories seriously. A Trip to the Moon was not the first cinematic depiction of space travel but it is commonly believed to be the first and is certainly the most significant and influential. 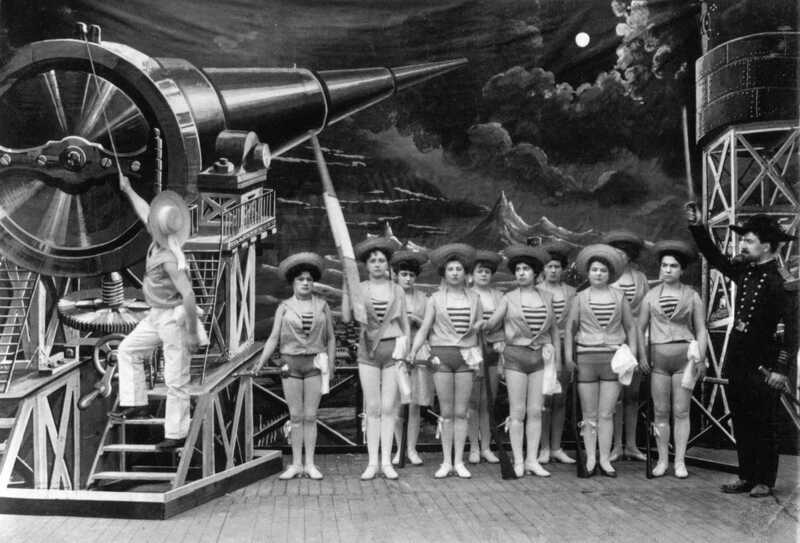 It is important to remember that Georges Melies comes to his idea of space travel from a background as a stage magician. His earliest films were simple expansions of stage tricks using stop-camera substitutions, double-exposures and matte-out effects. These became more sophisticated as Melies discovered narrative form and built elaborate sets and increasingly more detailed special effects. Nevertheless, at heart, Melies’s films were always simple trick effect films. Thus in the film, the depiction of spaceflight is something that exists more as a stage performer’s trick than anything that we would recognise as a modern space mission. 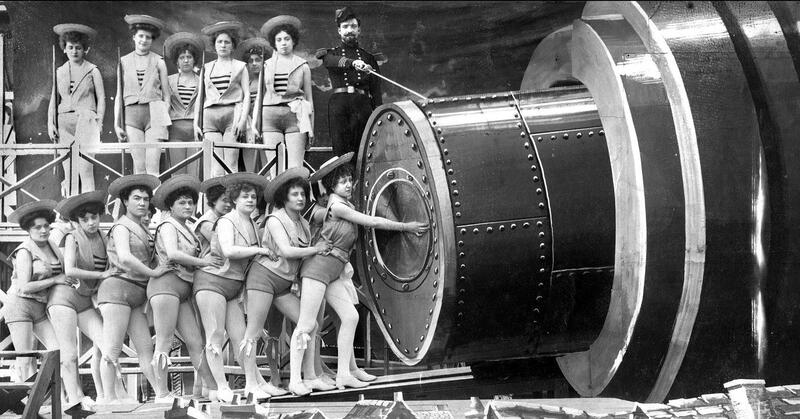 Rather than engineers with slide rules and lab coats, the expedition is started off by what look like alchemists or magicians in long beards, robes and pointy hats who seem to be doing so in a mediaeval setting, while the rocket is loaded by dancing girls that Melies recruited from the Theatre du Chatelet (not the Folies-Bergere as is commonly believed). Rather than any astrophysical reality, the Moon (and other planets of the Solar System) are depicted as having faces and personalities. What we have is less a work founded in the engineering speculation of contemporaries like Konstantin Tsiolkovsky and Werner von Braun than it belongs among the early flights of pure Lunar fancy from people like Lucian of Samosata, Francis Godwin, Cyrano de Bergerac and Baron Munchausen. Moreover, the problem that Melies and a number of his imitators shared was that they had a great deal of fun envisioning the comic adventures into the solar system but spared little thought for what would happen once the travellers arrived. Thus the films end up being comic escapades and then a quick retreat back to the Earth for the explorers to be claimed heroes – there was no sense of the idea of communicating with an alien species or of being able to have adventures on other worlds as was introduced by Flash Gordon (1936) and Buck Rogers (1939). Here, for example, the explorers’ first reaction to encountering Selenites is not the idea of trying to communicate or understand them but to batter them with their umbrellas, which for some reason causes them to explode. One suspects what was happening here is that these adventures into space were being envisioned along the lines of the first plane flights, the invention of the motor car and explorer’s journeys into the Polar regions that were happening in the real world around the time. Many of Melies’s imitators focus less on building a rocket than things like vehicles such as trains and cars travelling so fast they achieve escape velocity. (Indeed, you could make the argument that almost every single science-fiction film up until 1910 was a reaction – either in terms of comic future shock or a marvelling at the possibilities – to the major technological innovations that occurred in transportation and the discovery of electricity around the turn of the 20th Century). It was not until Fritz Lang’s Woman in the Moon (1929) that the idea of spaceflight and landing on the Moon began to be taken seriously and with some engineering credibility. 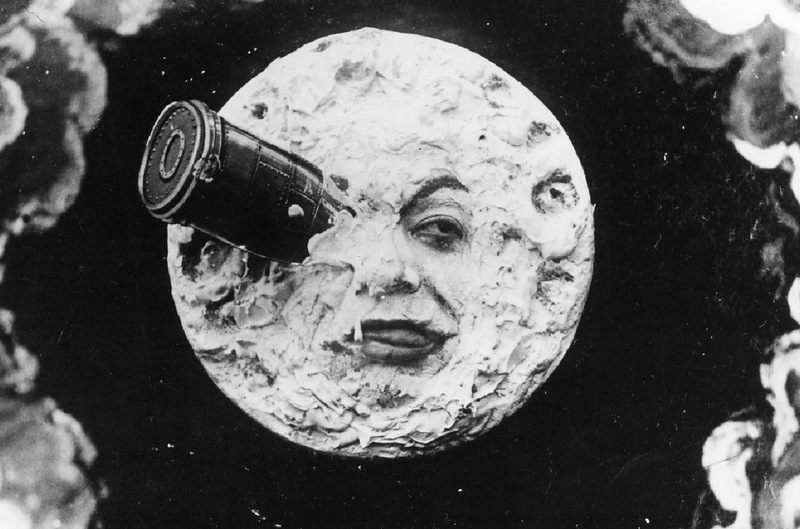 A Trip to the Moon is a classic, although I think that Georges Melies’s follow-up An Impossible Voyage (1904) is far more sophisticated film in terms of narrative and the elaborateness of effects in telling a very similar story (where travellers land on The Sun instead of The Moon). The narrative is certainly very condensed compared to what we expect today (the film is only fourteen minutes long) – there is no depiction of the journey to the Moon, the rocket launches and seconds later impacts in the Moon’s eye; there are slapstick hijinks hitting the Selenites who turn into puffs of smoke but the audience with the Selenite leader is over and done with in a matter of seconds. Each scene exists as a static piece unto itself because Melies and his contemporaries had not yet discovered the idea of cutting a scene up and moving the camera within it, meaning that each set-piece was akin to something that took place on the stage with the camera in the place where a live audience would be. A Trip to the Moon was a substantial hit, although Melies saw not much of the international profit after Thomas Edison had prints of the film stolen and copied, distributing them in the US himself. The film had a huge influence. There were a great many copies from other filmmakers of the day, such as Walter R. Booth’s The ? Motorist (1906) and The Automatic Motorist (1911), Segundo de Chomon’s A Voyage to Jupiter (1907) and his blatant ripoff of A Trip to the Moon with Excursion to the Moon (1908), and Thomas Edison’s A Trip to Mars (1910). The film has been homaged and recreated everywhere from Maurizio Nichetti’s Tomorrow We Dance (1982), which set the characters from A Trip to the Moon loose on modern society as aliens that cause people to start compulsively dancing; the Smashing Pumpkins music video Tonight Tonight (1996); to the Le Voyage dans la Lune episode of the tv series From the Earth to the Moon (1998) about the real-life Apollo mission; in the BBC tv version of H.G. Wells’s The First Men in the Moon (2010); and Martin Scorsese’s Georges Melies biopic Hugo (2011), as well as being spoofed in episodes of The Simpsons (1989– ) and Futurama (1999-2003). The making of the film and the modern 2011 restoration of a hand-coloured print is also discussed in the Melies documentary The Extraordinary Voyage (2011).